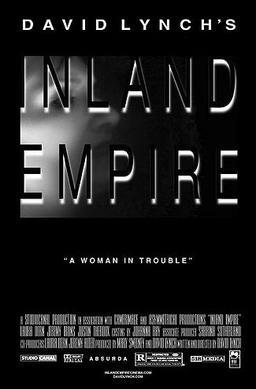 The final film in my trip through David Lynch’s retrospective takes me to ‘Inland Empire’, Lynch’s longest film and perhaps his most labyrinthine to date. The film is a co-production between the US, France and Poland, and indeed a lot of the film is shot in Poland with Polish actors filling several key parts. Loosely, the film is about Laura Dern’s Nikki Grace, an actress who gets a comeback role in a film called ‘On High in Blue Tomorrows’, which turns out to be a ‘remake’ of an unfinished film called ‘47’ which halted production when the lead actor and actress were murdered. This creepy premise hangs over the whole film and appears to be the driving force between the psychological unravelling of Nikki’s mind. The film begins with several unusual scenes, from a young girl crying as she watches the TV in a darkened room, to the events happening on the TV which appears to be some kind of sitcom with anthropormorphic rabbits (voiced by 3 of ‘Mulholland Drive’s’ cast), before we move into what appears to be the present as an elderly lady comes to visit Nikki. Throughout the course of the film, Lynch would return to these recurring motifs. We are introduced to the key players in the film within the film, including Justin Theroux’s male lead, Jeremy Irons director and Harry Dean Stanton’s assistant, before proceedings start to move into increasingly more surreal territory. One of the tricks Lynch pulls with ‘Inland Empire’ is in creating an atmosphere and an environment where the viewer is constantly uneasy and kept off balance, with it rarely entirely clear whether we are watching a scene being shot for the movie or real life. Both experiences seem to merge throughout, and as we delve further into the making of the film the reality and fiction blur even further. Coupled with this, we return to the young girl sitting in the darkened room on several occasions, and we spend time in what appears to be Poland in the past (could this be the narrative merging into the timeline of the original, unfinished film?). The middle act of the film becomes particularly hard to follow because of this, as we jump between various scenes that often appear to have no connection to one another, between past and present, between Polish and English. Trying to hold all of this together is Laura Dern in the central role, and she carries the film superbly. Throughout the course of the narrative she has to portray a whole range of emotions, across different versions of the same characters, and she successfully gives off the impression that the events happening around her are as alien to her as they are to the audience. Like many of Lynch’s films, trying to grasp the purpose of the narrative is a fool’s game, but I think Lynch is trying to make a point here about the lengths an actor or actress has to go to in order to fully embody a character. In the case of ‘Inland Empire’ and Nikki Grace, she has gone to such great lengths to perform this part that it consumes her to the extent that she can no longer separate real life from her performance. ‘Inland Empire’ isn’t one of my favourite David Lynch films – I found it often too hard to follow and confusing, but it does feature a terrific lead performance from Laura Dern and it builds off an intriguing premise to create a multitude of memorable scenes that never fully manage to connect together. David Lynch as a filmmaker is one of a kind, a true original, and I hope that this film (released in 2006) isn’t his last. Next up, I’ll take a couple of weeks off before returning with another director retrospective. I’ve a couple of thoughts on who to tackle next but I’m open to suggestions regardless!